The verdict is in. And the results confirm what you’d always thought… Overweight dogs don’t live as long as normal weight dogs. So, how much should you feed your dog to ensure his health? Well, don’t just blindly follow the directions on a dog food package. That’s because manufacturers like to “hedge” by suggesting an overly broad “range” of serving sizes. For example, a bag of kibble might read… “for dogs from 5 to 15 pounds feed 1/2… to… 1-1/2 cups a day”. Wow. That’s a monstrously wide range… a 200% variation! It’s simply not precise enough. If you follow that advice you’ll be guessing. You could be significantly overfeeding… or underfeeding your dog. Misjudging a serving size by even a small amount… and then feeding that same amount day-in and day-out… multiplies the error. And it could have a devastating effect on your dog’s health. When deciding how much to feed your dog… never guess. Be scientific. Always calculate and measure. Then, use a measuring cup or a scale… and feed the calculated amount. Of course, keep in mind… results are approximate. Certain breeds and conditions may require some adjustment. And please remember… the calculator assumes your dog is at or near his ideal weight. So, be flexible. 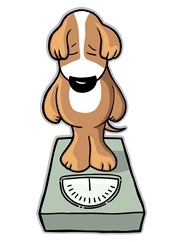 If your dog appears to be overweight… or underweight… substitute something closer to “ideal” for your weight entry. By the way… the calculator is for adult dogs only. Puppies require their own special feeding program. Once again… never guess. Always measure each serving. And check your dog’s weight once a month or so. Over time, you’ll be glad you did. Learn how to determine your dog’s ideal weight. Here’s an easy way to weigh your dog. Use our Dog Food Calculator to reveal your pet’s recommended serving size.